Welcome to Wordle. This site is really cool. 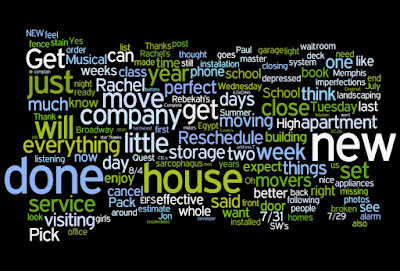 Wordle is a toy for generating "word clouds" from text that you provide. The clouds give greater prominence to words that appear more frequently in the source text. And you can tweak your cloud with different color schemes, fonts, and layouts. For my Wordle, I put in the link to this blog. It took all my posts and produced this Wordle. So, you can see which words I have used the most!! And we all know, I WANT MY NEW HOUSE DONE!!! Funny....nice little breath of fresh air during this stressful, depressing time. Just wanted to share this with you all. If you make your own Wordle, be sure to share it with me!! Thanks to my friend, Chris, for sharing his fun find!